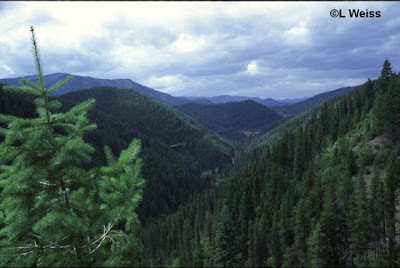 One of my first adventures shooting the Milwaukee Road was several years ago on its breathtaking Bitterroot Mountain crossing. There are few other places where the Milwaukee's original vision and commitment are displayed so boldly. The shear scale of this mountain pass is humbling, made all the more so by the many trestles and tunnels that dot this mountain range. There are many places where the Milwaukee's Pacific Coast Extension seems so well kept that rails could be relaid today and trains could run tomorrow. Vendome, MT is one of those places. As the Milwaukee pushed west, it began its climb out of the Jefferson River Valley and up one of the famous loops of western railroading: Vendome Loop. On this stormy day in 2005 the old path of the right of way is still clear beneath the bridge of highway 41. The first of many sweeping curves begins the road's assault on the mountain grade as it heads toward the summit of the Rocky Range. Old AC power lines are still in place here and the surroundings look little changed from days when boxcabs pushed trains up and over the pass. 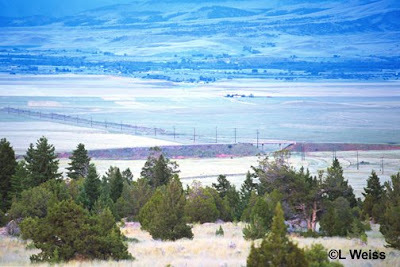 This area on the east side of the Rockies lies in a rain shadow, and trees are sparse just as they were 30 years ago when the last dead freights fought their way upgrade.